Previously our main web uploader was a Java based applet, which could handle folders and camera cards (unlike the HTML5 drag and drop we uploader we have now). We recommend using our desktop application for big uploads, folders and camera cards, although it may still be possible to use the web Java applet, depending on what browser you have available. As browsers moved away from allowing Java based NPAPI applets, the choice is limited to utilise this tool (which is why our longer term plan is to remove it). 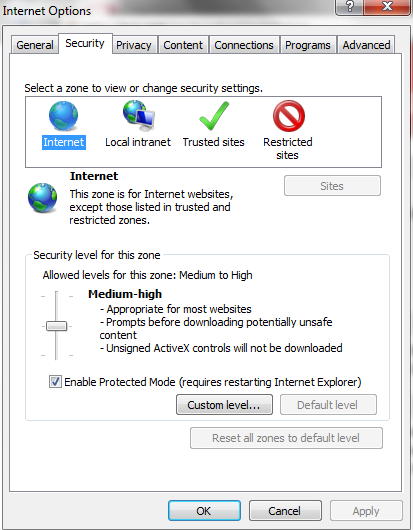 On Windows, the applet is still supported in IE 10. 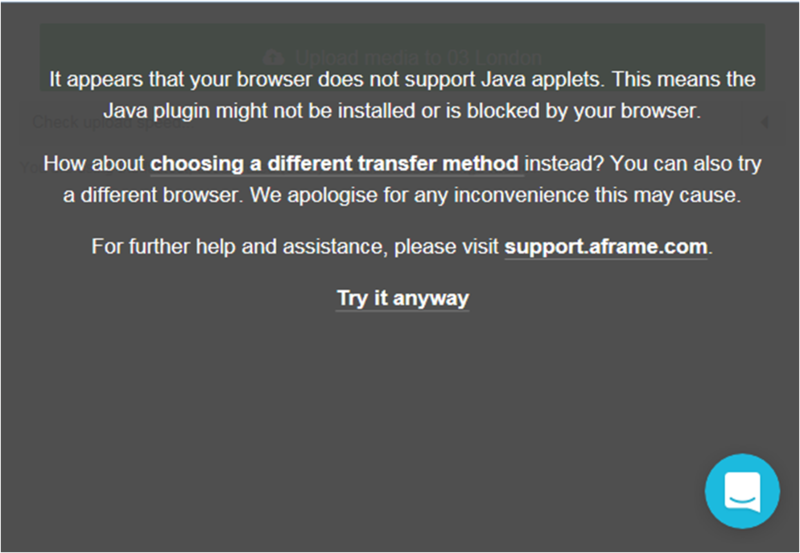 IE11, Edge, Chrome and Firefox do not support Java applets (we mention a IE11 work around later in this article). The browser-specific instructions detailed below are given on the assumption that the user has installed the latest version of Java on the machine used to conduct the upload and it is not working. 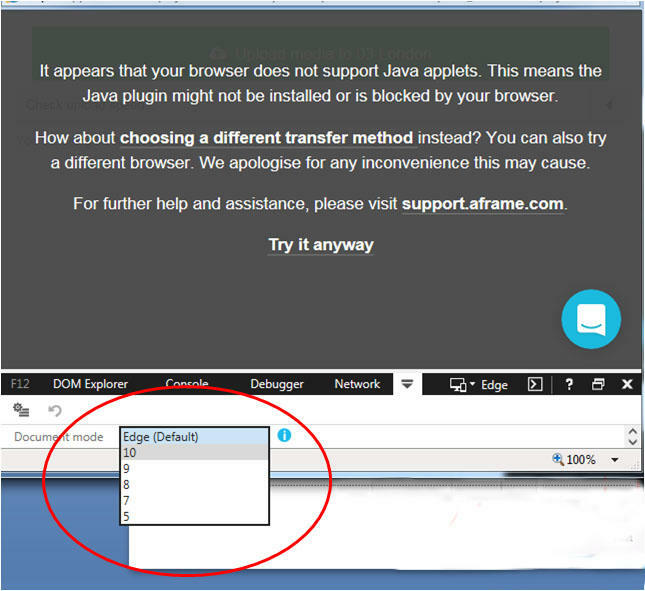 Enabling Java for Internet Explorer versions 9, 10, (Microsoft have removed support for Java in IE 11 and Edge, see further down this page for a work around). 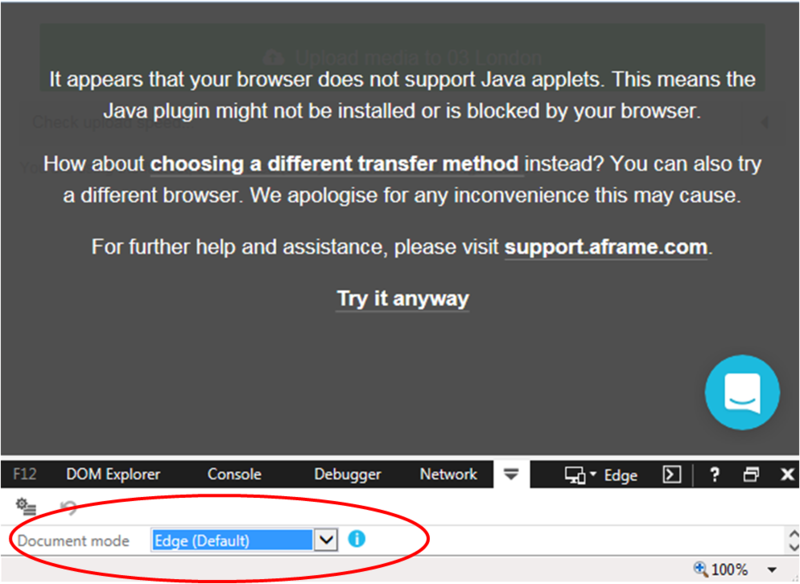 Uploading via the web HTML5 uploader and the desktop application works as normal but if you do want to use the Java applet for upload, IE 11 & Edge do not allow you as normal. There is a work around where you can emulate IE10 within IE 11 or Edge. This method works for upload only and assumes you have the latest version of Java installed. 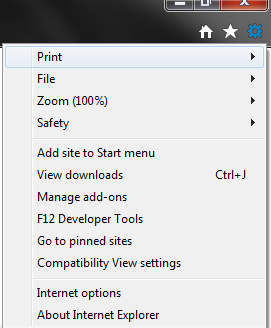 Select the drop down window and a list of previous IE versions will show and by selecting them IE11 will emulate that browser, so select IE10. Once you have finished uploading, just select the drop down window and switch back to Edge, then press F12 to remove the extra options. If you need any help with this please please contact us via the chat or contacts and we will walk you through it. Need an alternative? You may find our third party FTP service useful.